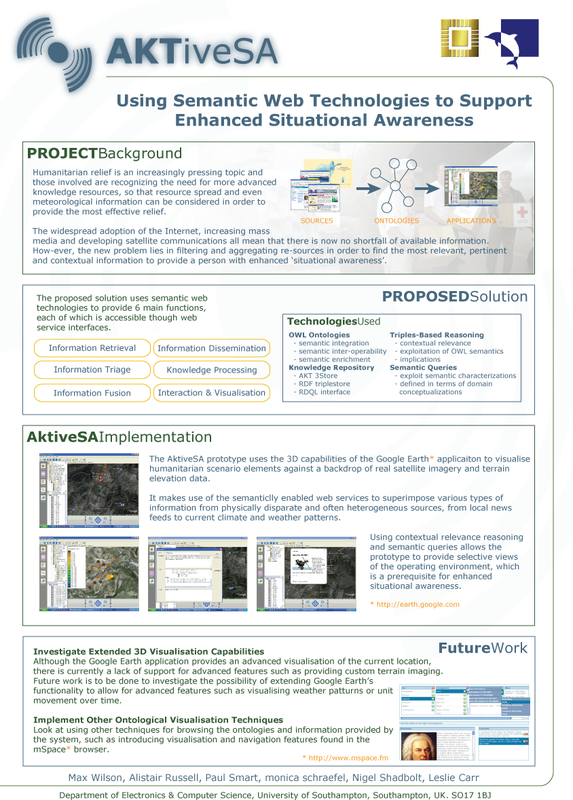 The AKTiveSA project is using Semantic Web technologies to support information fusion and enhanced situational awareness in a simulated humanitarian relief scenario. We have developed an application that shows how situational awareness can be supported during humanitarian relief situations; often occurring alongside military conflict. Semantic Web technologies provide new opportunities for harvesting information from numerous, disparate and often heterogeneous information sources and can be used to better support complex knowledge fusion. Wilson, Max L., Russell, Alistair, Smart, Paul R., Shadbolt, Nigel, Carr, Leslie and schraefel, m.c. (2005) Using Semantic Web Technologies to Support Enhanced Situation Awareness. 4th International Semantic Web Conference (ISWC). 06 - 10 Nov 2005.